Do you still have your own "go to" place when you want to relax, unwind, or just have a few bottles with your peers after office hours? I have my favorites, I'm sure you do too. 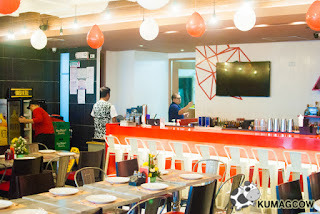 Well, there's a new spot in the south of EDSA that promises a great venue to eat lovely Filipino dishes, enjoy really good mixes and just plainly have a good time. 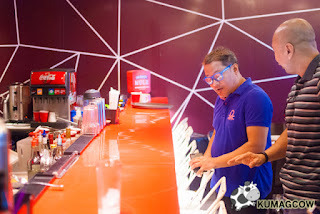 It's called REDD, a gastronomy bar found in the 4th floor of the grand Prism Plaza. It's that quirky looking building found just beside the SM Mall of Asia in Pasay City. Just go up the flight of stairs or use the escalator in the middle so you can get to the restaurants on the same floor. Admittedly, I wasn't really aware that restaurants were actually sprawling here. If I usually go to this area, I'd probably be hanging out at the SM Mall of Asia most of the time. That's a mistake. This place is cozy, plus there are artists every night who perform live. Even if they don't publicize it that much, Prism Plaza gets packed to the brim sometimes because of this. Since they're officially open now, they're dishing out a few specials so you could enjoy food and booze with friends and office mates there! Let's take a look at their place first! 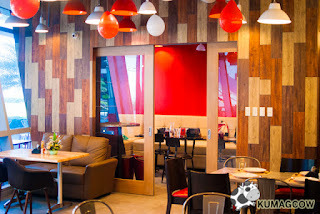 This establishment is owned by partners and builders who also did interiors for 5 star hotels in Manila. The walls and decor stayed geometric, a little industrial with accent walls with wood panels in different shades, plus plexiglass for the bar's counter. 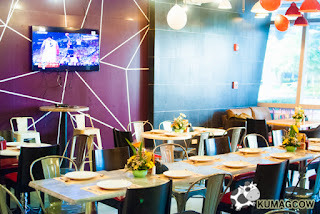 They have a private room equipped with KTV, perfect for small parties when you need it. They also used different lamp light fixtures for the lighting and several more on the actual exposed ceiling. This is pretty nice, not intimidating. REDD serves legit Filipino food, not just bar chow - but they've got a lot of that too. They even have regional favorites which surprised most of us because it's in the menu. 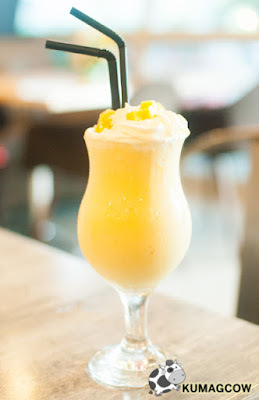 We had our drinks first, on the left is the Pina Lemonage which is a concoction of Orange Pineapple Lemonade juice done in shake form, while on the right is the Mango Cloud which is your well loved mango shake with whipped cream - I could compare it to Mango Tango if it were dessert. 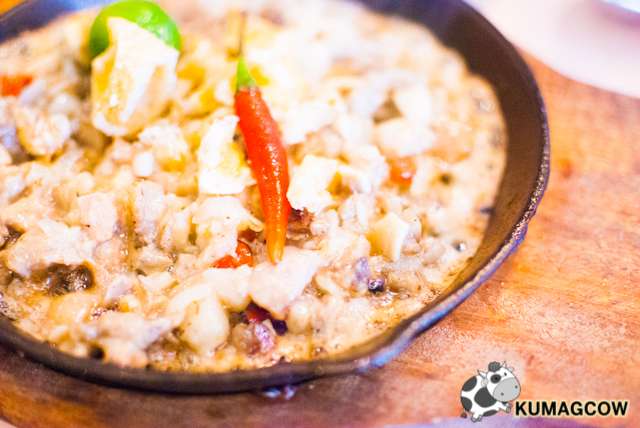 Sisig Ala Kanto - Part of their appetizers, this version of Sisig is perfect for pairing with beer. An option to slice open the chili that's put on top would be good. 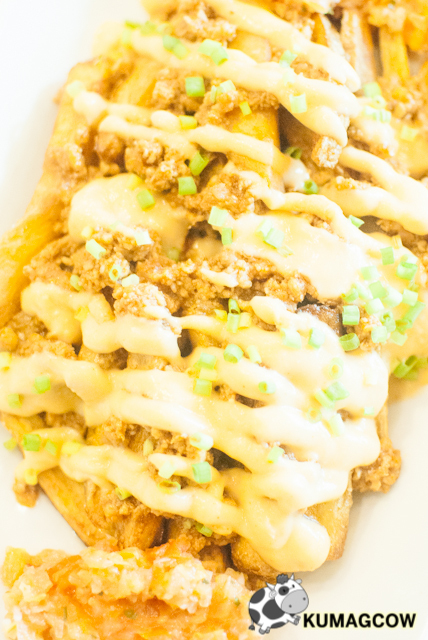 Juana Fries - Cut up sweet potato fries, fried til golden, plus the usual sauce and hearty chili on top. 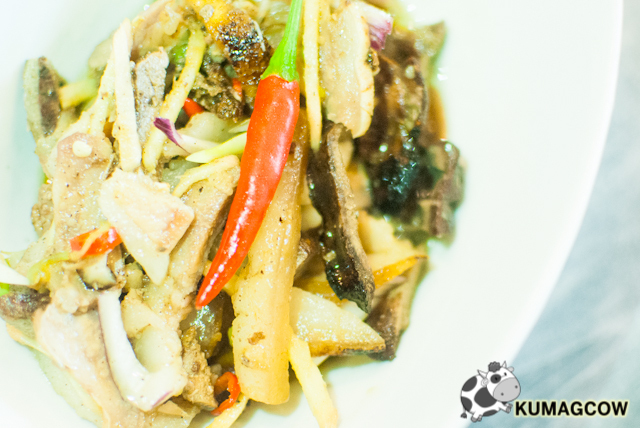 Wen Manong - Chopped up Pork put on high flame, crunchy, mixed with liver and their own sauce. Tasted like a white version of Dinuguan. I loved this with white rice. 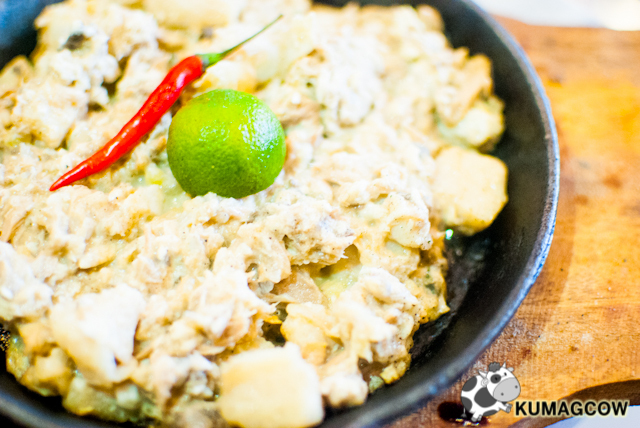 Tuna and Bangus Sisig - The lovely cooked Milk Fish shredded and deboned plus chunks of Tuna sauteed with garlic and onions, then placed on a hot plate so it could be crunchy on the bottom. It's a healthier version of the sisig, pretty good! 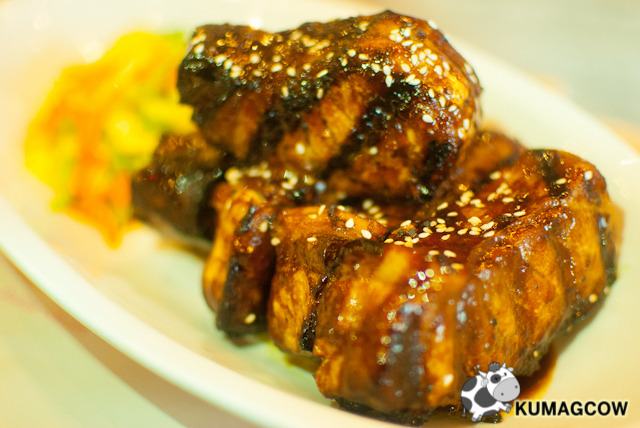 Grilled Tuna Belly - Thick premium slices of Tuna grilled and basted with sweet sauce, a little nutty, big and meaty. Love this with rice, another option for those who don't want pork on their plate. 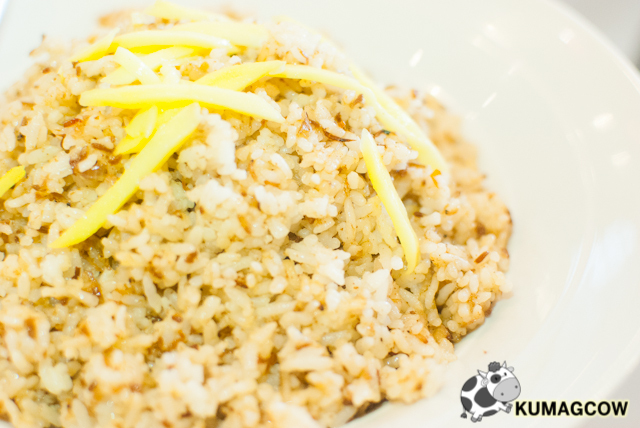 Bagoong Rice - This one is good while it's hot, so make sure to put loads of it on your plate. Not too salty, just right. 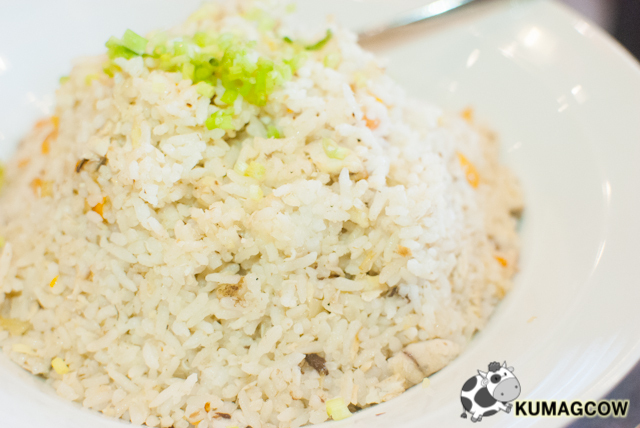 Tinapa Rice - For those who want it a little smoky rice variant, try the Tinapa rice. Perfect for those fried items on their menu. 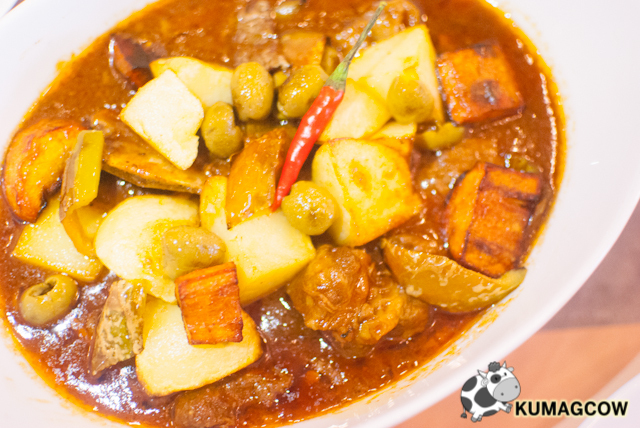 REDD's Caldereta - Lovely chunks of beef, soft potatoes, carrots, olives with heavenly tomato based sauce. This is so good I could finish this whole bowl to myself. Have this with plain white rice, super good, highly recommended! 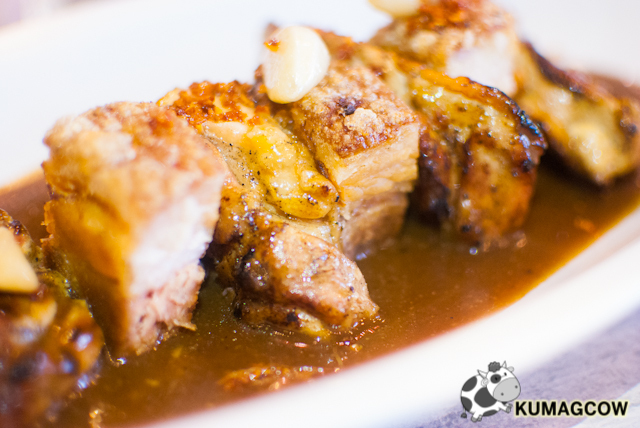 Chicken Pork Adobo - Think of Chicken Inasal, Bagnet Pork Slices mixed in with the marinade and sauce of well loved adobo. It's easy, give in, do not hold back on the rice. Gising Gising - Winged String Beans, Tofu squares, made a little spicy for good reasons. 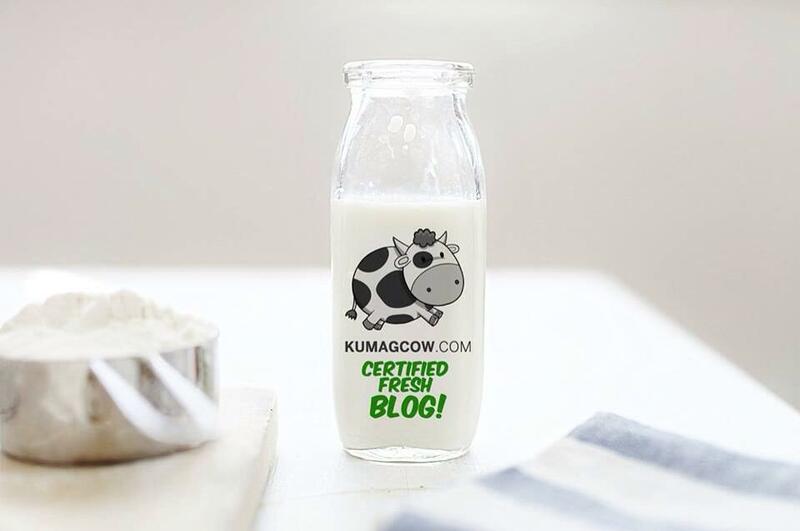 You can also pair this with Tinapa Rice, or the plain one, it will make you a little sweaty but totally worth it. This is also good for beer pairings. Aligue Pasta - Best eaten when hot is this Aligue Pasta. If you're so bored by the normal res and white sauce, this would be a good competitor. It's a little on the fishy side though because of obvious reasons, a little rich too. 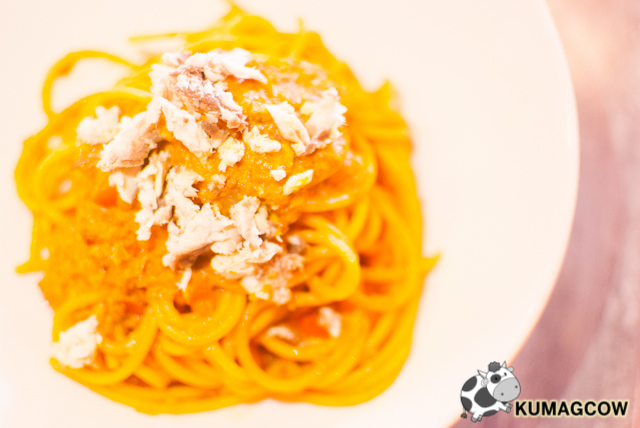 It has tuna pieces on top to serve as meat, making it a tad healthy even after all that crab roe. 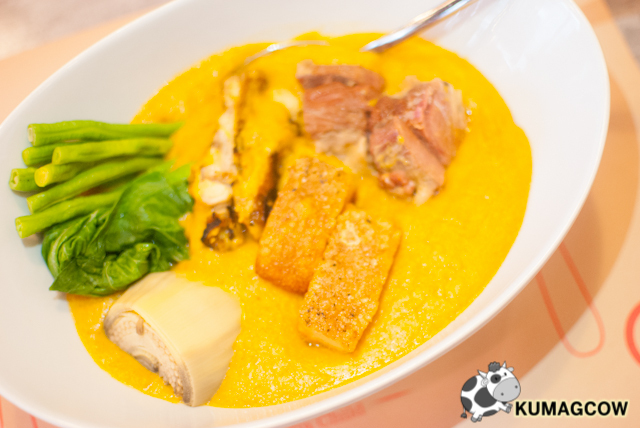 REDD's Kare Kare - Their version is a deconstructed Kare Kare. You've got the veggies, the banana heart, Bagnet Pork Slices, Chicken Inasal, and almost corned beef. Make sure you also eat this while it's hot as the thick sauce becomes too thick if you let it stay on the table for too long. 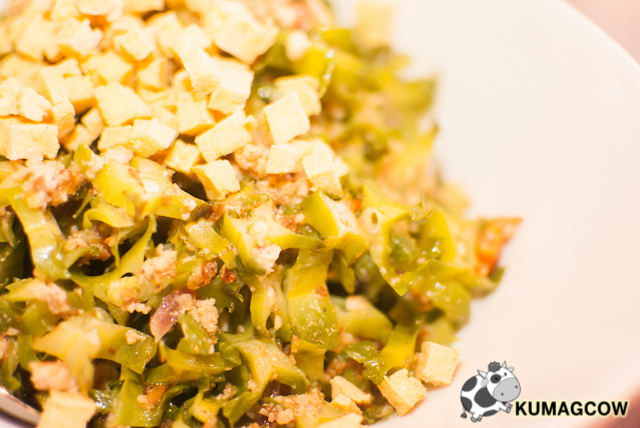 Have it with the Tinapa Rice, it's rich and flavorful! 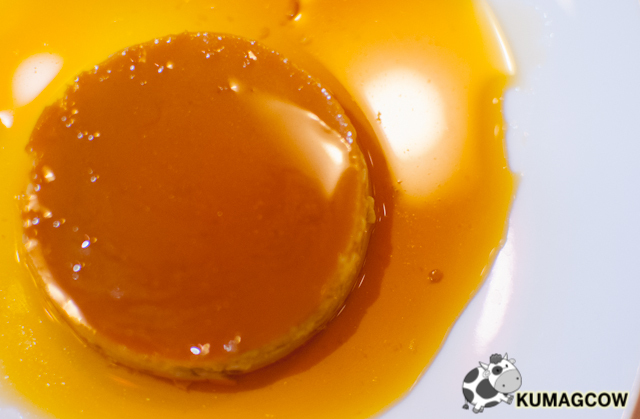 Leche Flan - Dessert option, this one's just right, not too sweet and has lime flavor on the mark. Turon Overload - If you're a sweet tooth, try this Turon Overload. It's fried banana fritters wrapped in rice paper with jackfruit slices, cut in half and sprinkled with cinnamon. Served with Vanilla Ice Cream on the side, do I need to really convince you to order this? I guess not. There are new places in the south that are worth the trip, this one is. 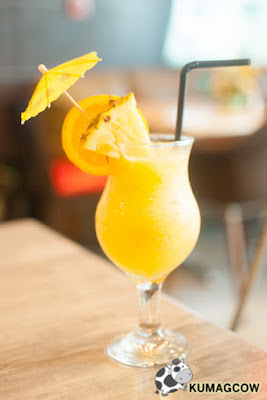 They've got entertainment, privacy, the majestic sunset on Manila bay, good food and drinks. All you need to do is trek there and get it! They're at the 4th floor of Prism Plaza, Two ECOM Center in Pasay City. 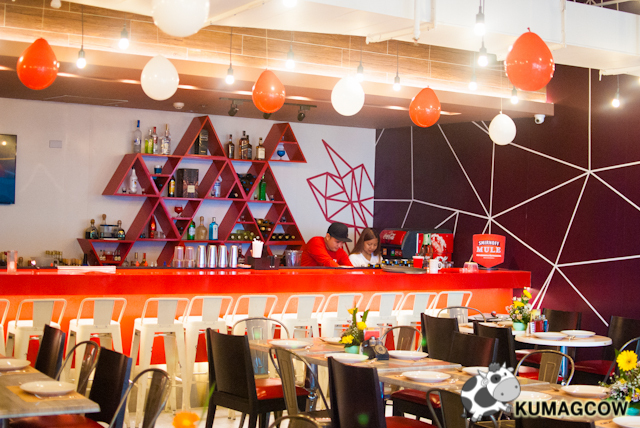 You may call them today at 808-76-83 and reserve for functions or events. They're open from 11am to 1am. I'm going back there very soon!